Rise and shine, a new day awaits! So, I did it. I was sensible. 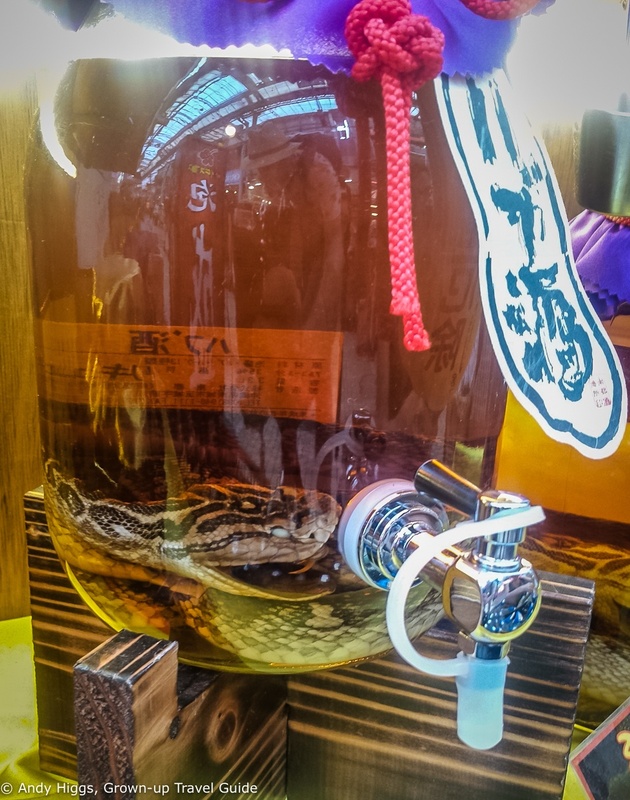 As you may recall from the previous instalment of this Okinawan tale, our entire group had been unanimous in deciding to call it an early night on Day One and return to the hotel instead of exploring Kokusai Street. 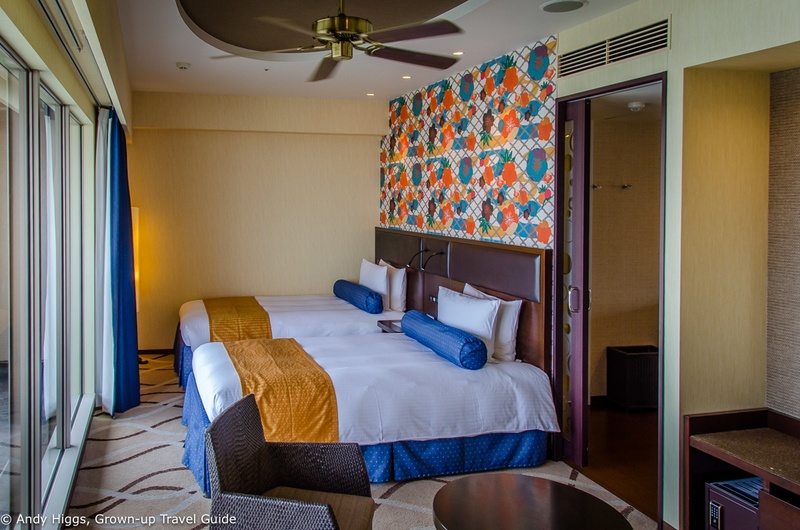 But even more importantly, I actually went to bed almost as soon as I got back to my room at the Naha Terrace hotel. No internet, no Japanese television, no writing. Just sleep. When I was ready to go downstairs I rummaged around to find my breakfast docket among the slew of vouchers and papers I had been given upon check-in. 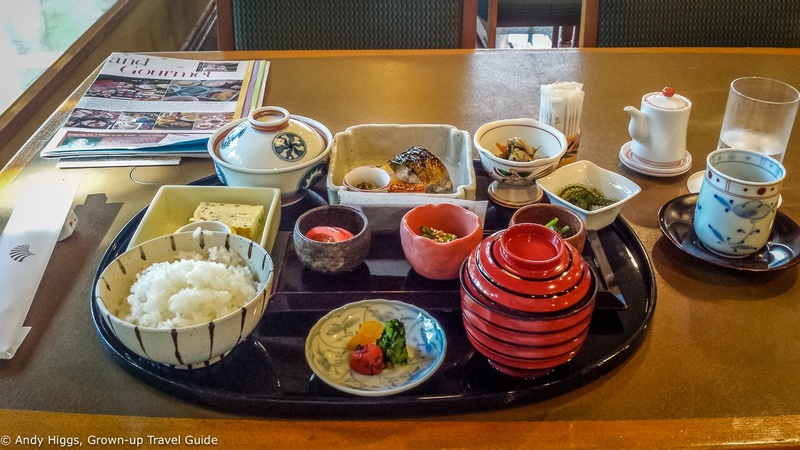 At the Naha Terrace guests can choose between a Western or Japanese breakfast, and it boggles my mind that anyone would choose the former but evidently 90% of guest do. At least that’s what it seemed like by the relative sizes and occupancy rate of each dining room. The member of staff outside the Western breakfast room couldn’t hide his surprise as he beckoned me in and I politely explained that I was headed to the dining room round the corner. After an enthusiast welcome from the head waiter I was shown to an empty table – there was only space for a handful of guests and there were only three others during the time I was there. 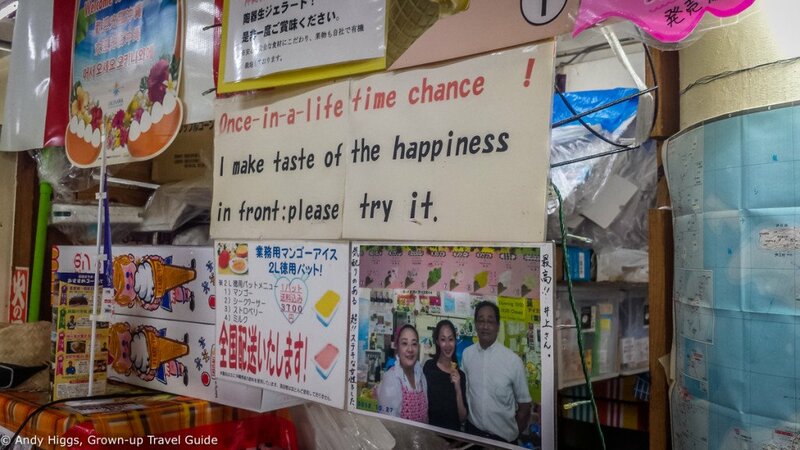 Each to their own, live and let live and all that, but would you really come to Okinawa and choose egg and bacon or waffles and syrup over this? What a way to start the day – fresh, light and incredibly tasty. I didn’t even miss coffee, and in fact didn’t drink a single cup until I was at the airport on my way out of Okinawa. If this is what it takes to add a few years to your life, then count me in. I returned to my room feeling fully satisfied without that slight pang of “I probably shouldn’t have had that third trip to the buffet” which often weighs my conscience after a hotel breakfast. Meeting our group in the lobby shortly afterwards, it was time for more sightseeing. 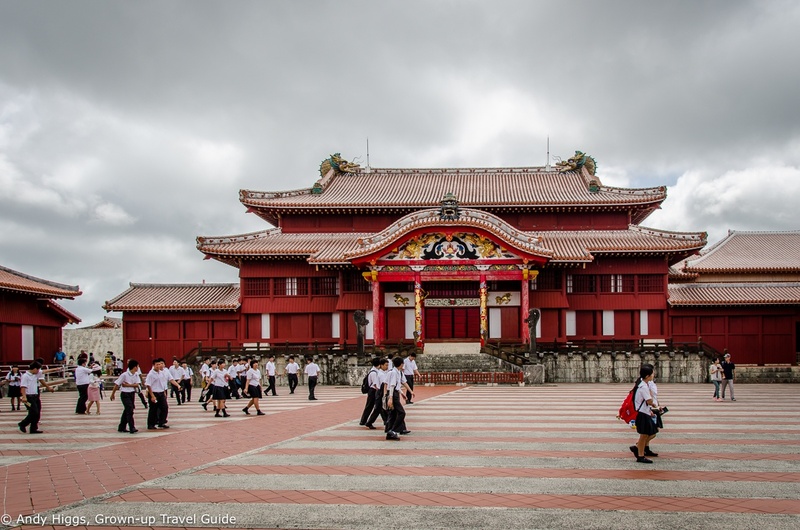 This is an absolute must-see in Naha City – and everyone knows it. You won’t be alone, but don’t let that put you off. The first thing that struck me was how well organised the place was – the underground parking lot was spread over two levels with space for both tour buses and regular vehicles. Emerging back on ground level guests are greeted by a large lobby and exhibition area with displays about the castle and a detailed model of the area as it was in the Ryukyu era. Coin-operated lockers are available to store any gear you don’t want to carry with you and there is also a restaurant and coffee shop here too. 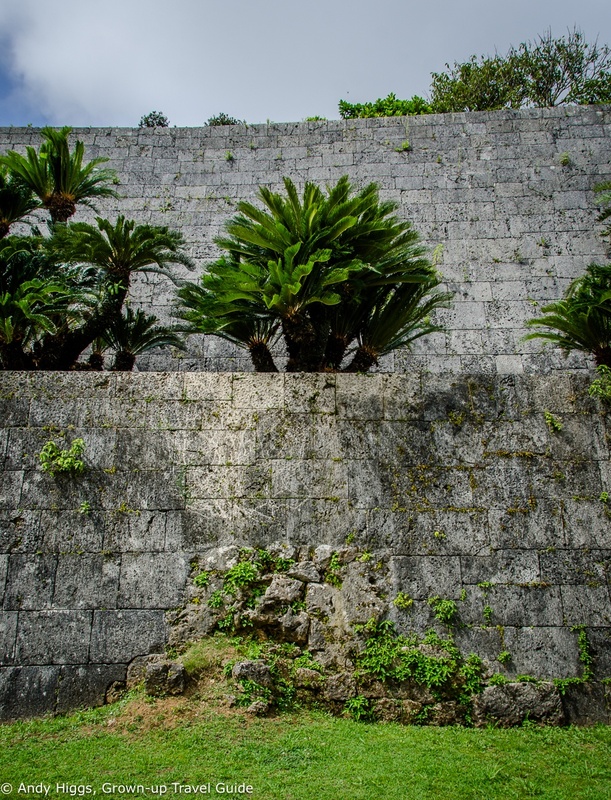 But then I shouldn’t really have been surprised – despite the fact that this is an ancient castle, it is in fact a replica of the original which was completely destroyed in the Battle of Okinawa in 1945. The first parts of the reconstruction did not open to the public until 1992, with new sections added regularly ever since (most recently in 2014). This goes a long way to explaining the up-to-date and practical facilities. It is not known exactly when the original Shuriho Castle was built but records show that it became the king’s official residence early in the 15th century and it was later expanded. Most visitors take the same marked route through the grounds and it is suggested that you allow 90 minutes for this. The main castle has two gates – the first one is Shureimon. It is, as you can see, a very popular place for a selfie or indeed a massive group photo. 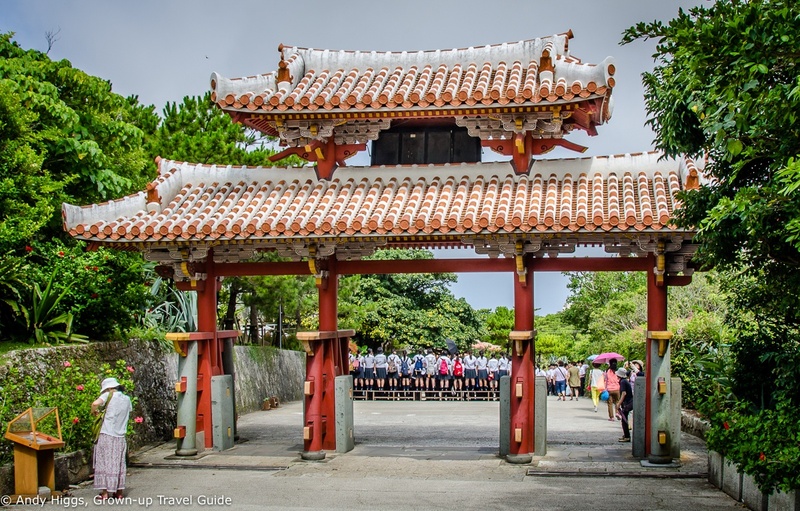 After passing through Shureimon Gate, Sonohyan-utaki Stone Gate will be on your left. 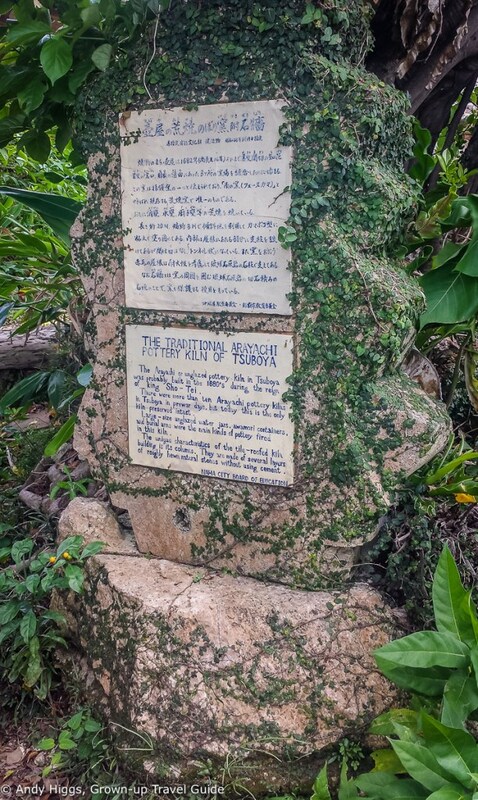 This is where the king would pray for a safe journey as he left the Castle. 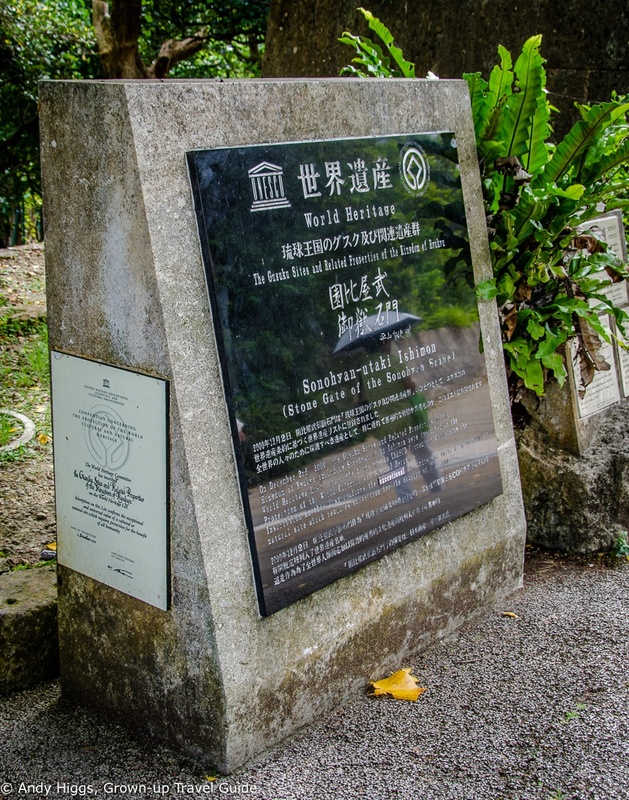 This gate has a place on the UNESCO Register of World Heritage Sites as evidenced by the plaque beside it. Look out for a small part of the original wall which remains and has been incorporated into the reconstruction. The path then leads through the Kankaimon Gate which is the entrance to the actual Castle, up steps past the Ryuhi spring and through Zuisenmon Gate. There are good views over the city from this area as well as replicas of an ancient bell and sundial from 1458 and the 18th century respectively. Tickets for the inside area for which admission is paid can be bought at the booth here too. One final gate brings you to the Una or courtyard. The Seiden (Royal Palace, shown in the background above) faces the courtyard, along with other structures including the Nanden/Bandokoro where events were held and officials entertained and the Hokuden which is where legal and state matters were handled. You’ll need to take off your shoes and carry them in the plastic bag provided when inside. Photography is also prohibited in certain areas. 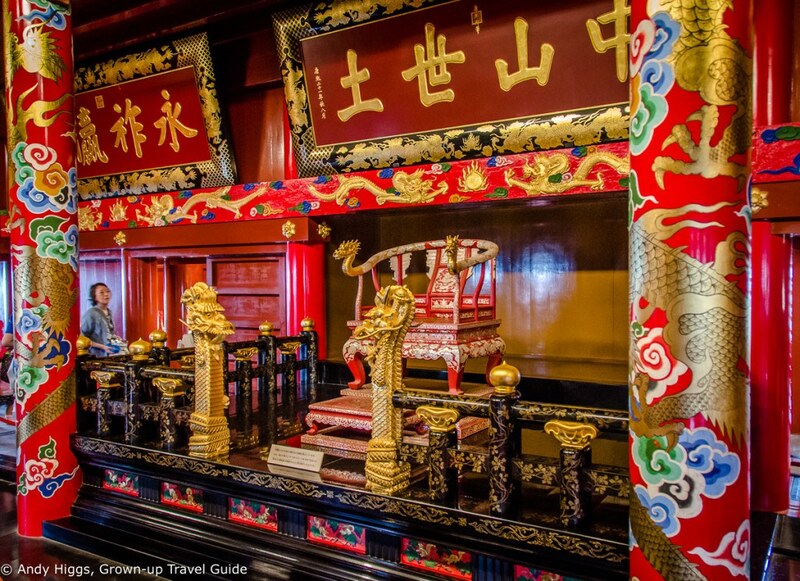 The Chinese influence is clear in much of the decor inside the Royal Palace. It’s a fascinating place to visit and it’s worth spending a few hours at the site. We were up against the clock and I look forward to returning to learn more about the Ryukyu Kingdom. Shurijo Castle, 1-2 Kinjo-co, Shuri, Naha City. For us, something more “hands-on” awaited just five minutes walk down the road. 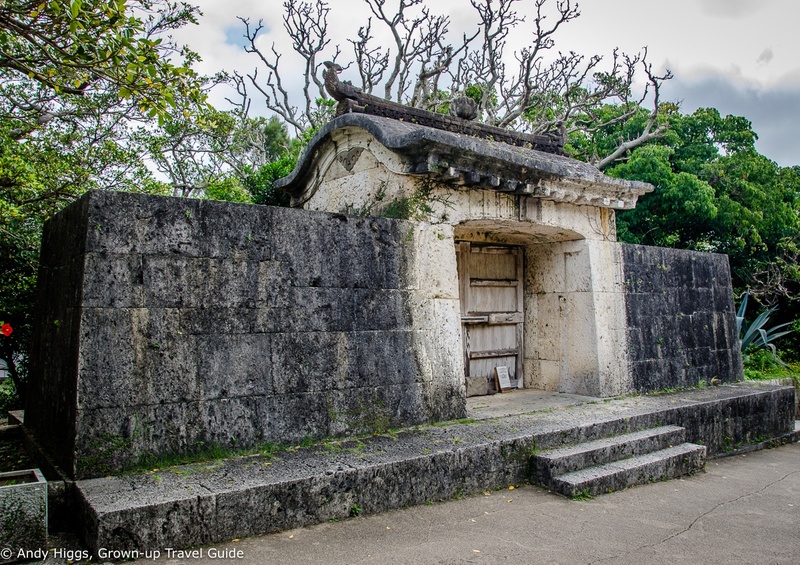 Located very close to Shurijo Castle, Shuri Ryusen was established in 1973 as a research institute to secure the future of Bingata dyeing in Okinawa. 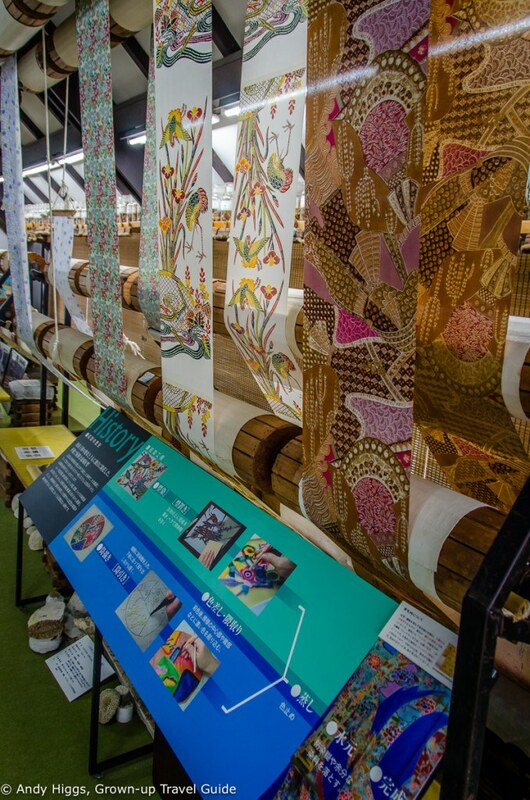 Its founder, Koto Yamaoka, basically saved the tradition that had begun to fade after World War II, particularly due to a shift from natural to synthesised dye which resulted in lower quality products. 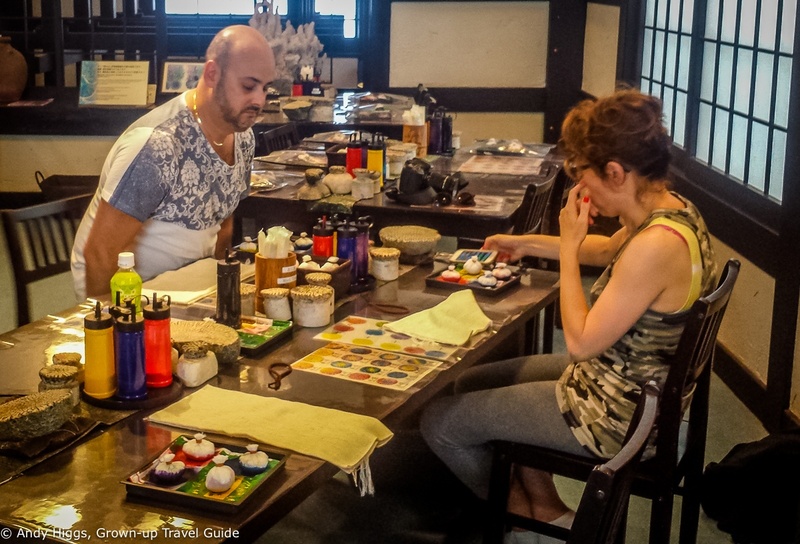 Thousands of plant dyes were researched and documented and today the centre has an exhibition area detailing both Bingata and coral dyeing, a gallery of laquerware and pottery as well as a dyeing workshop. Bingata is a complex method of dyeing clothes popular for forma wear. Designs are often simple but very beautiful and colourful. 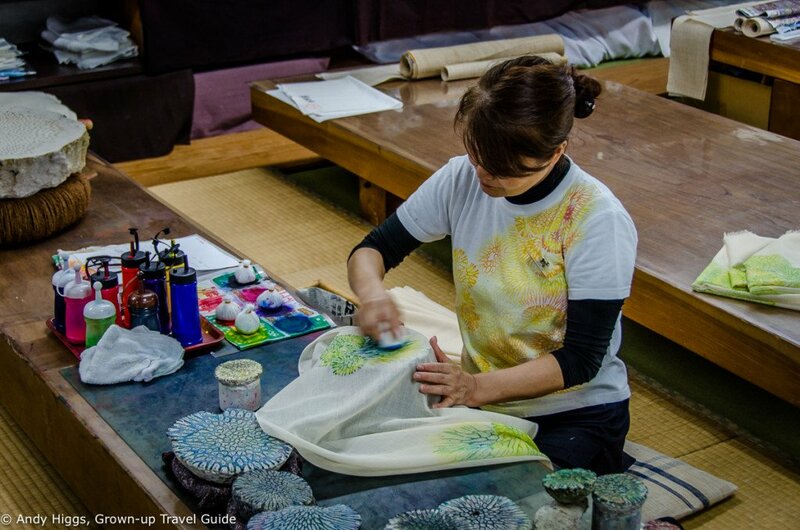 Another reason to visit Shuri Ryusen is to try your hand at coral dyeing. This process involves stretching material over a coral fossil and applying colour using a sponge. You choose a type of material (t-shirt, scarf, tote bag etc.) and are shown how to decorate it. Choose a coral (there are many different shapes and sizes) and the pattern will be transferred to the material when rubbed with the sponge and dye. You get a unique souvenir – and if you’re any good perhaps a unique gift for somebody – and it’s all good fun. The centre also provides financial support to preserve and replant coral reefs – which is another good reason to visit. Shuri Ryusen, 1-54 Yamakawa-cho, Naha City. Next on the agenda was a trip into the centre of town and the main drag of Kosubai Street again. 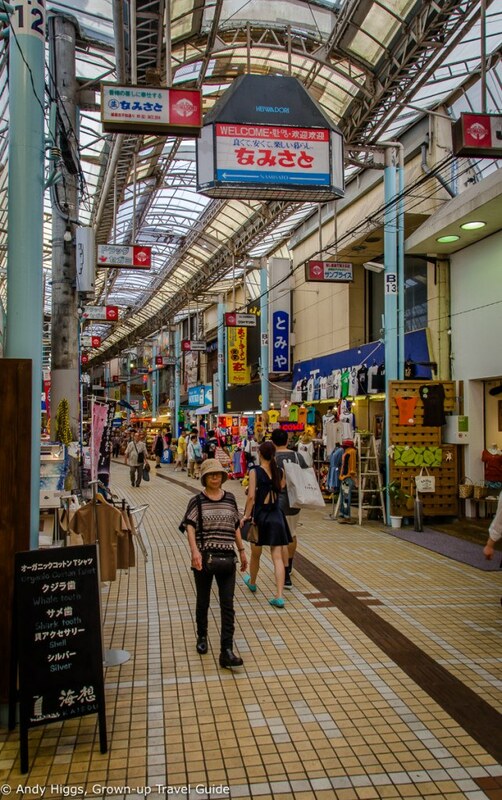 But this time our destination was the Makishi public market for a wander around and some lunch. 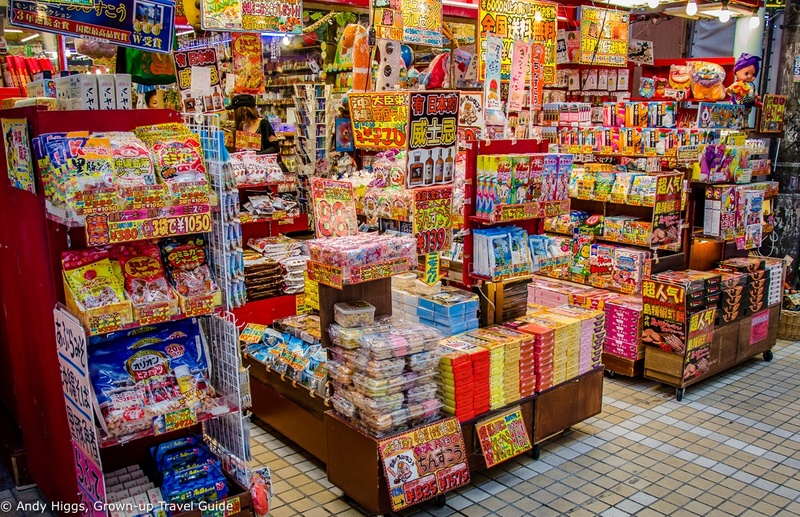 Makishi is a covered market or mall containing shops selling just about everything, but the food section is a particular draw. I just loved the fact that I had no idea of what on earth most of the stores were offering, sometimes even when their good were on display. Not everything on sale was immediately appealing, I have to say. 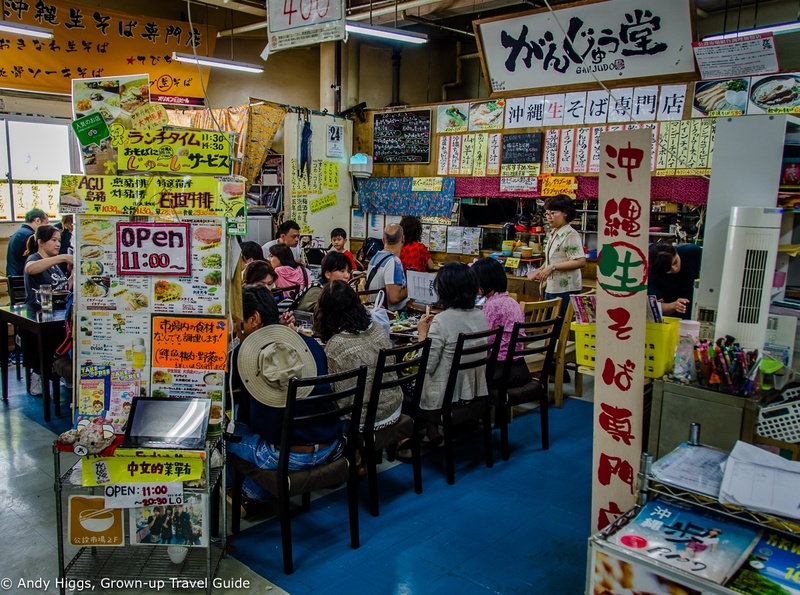 The food market (known locally as the ‘belly of Okinawa’ is in the central part of Makishi and the fresh fish and meat section is easily missed, entered through a small doorway between two stores. This mall-within-a-mall is a delightful assault on the senses and the seafood stalls are perhaps the most fascinating. 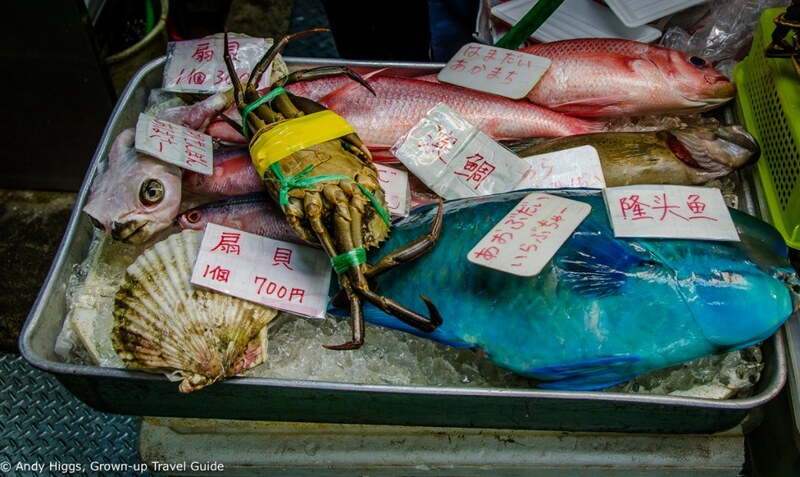 That skinless fish on the left looks oddly cute, doesn’t it? Many visitors buy ingredients on the ground floor market and take them upstairs to be prepared at one of several restaurants there. We ordered from the menu and at the risk of sounding both repetitive and predictable, the food was excellent. I was beginning to get better at the chopsticks thing, too. Pascal generously bought a round of ice creams from the stall next door as dessert – how could we resist? After that we set off for Tsuboya. 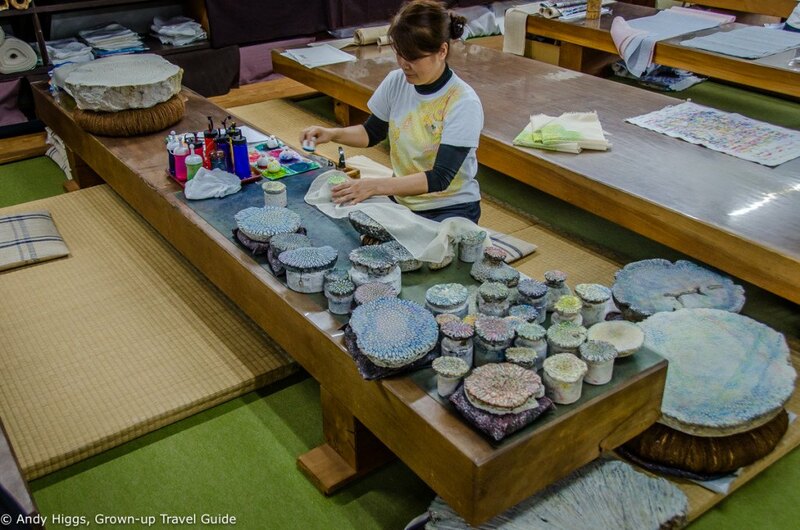 An easy stroll from Makishi, this area been the centre of local pottery production since 1682. The government brought a number of ceramics workshops together here and about ten are still going. We passed the old outdoor kiln which dates from the 17th century and is still intact. 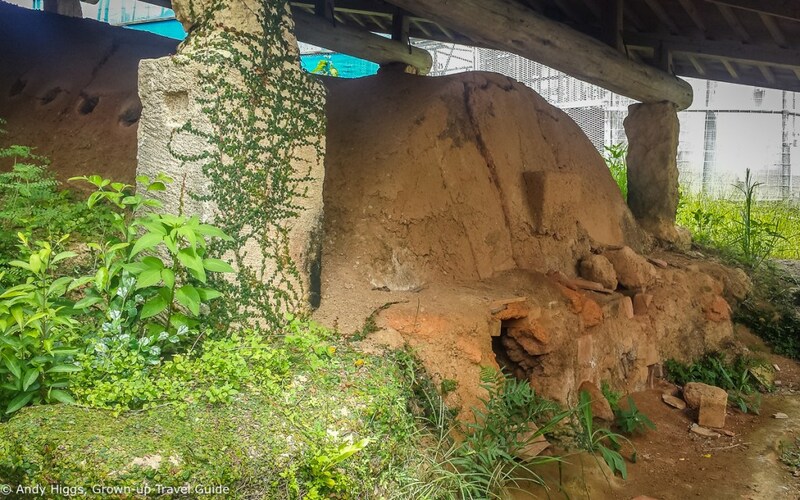 Due to the risk of fires these kilns are no longer permitted to be used in Okinawa city. 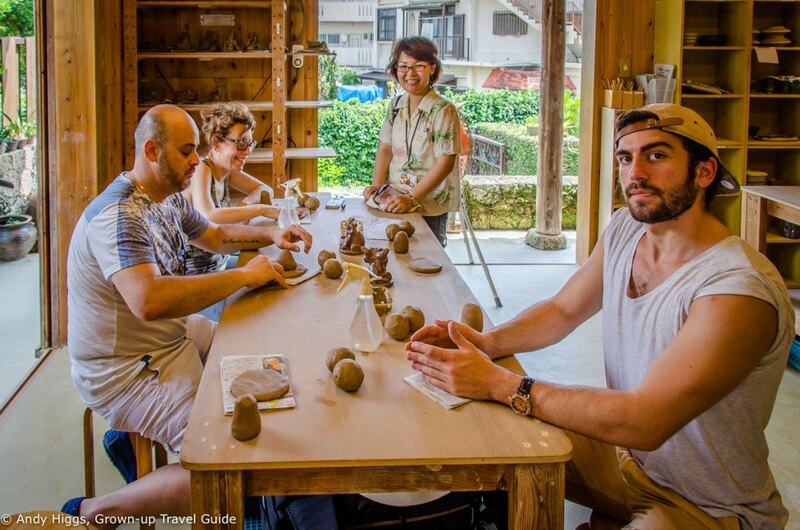 The Tsuboya Vill workshop offers a chance to try pottery; choose a style and you’ll be guided through the process. 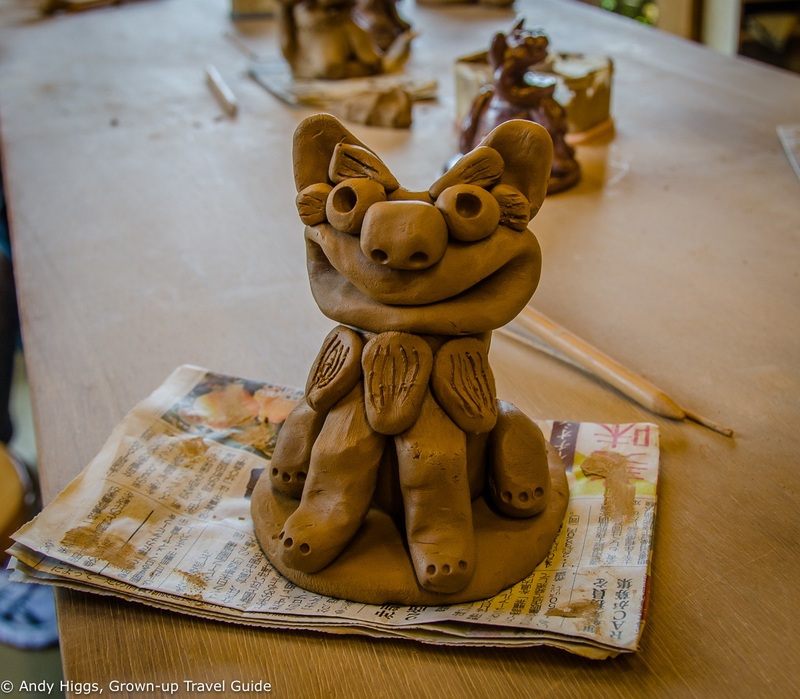 We decided to try to make a Shisa lion; these are the figures seen in pairs outside most buildings in Okinawa to protect the property. A new hotel now beckoned, and we drove across town to the rather verbosely-named Loisir Hotel and Spa Tower. 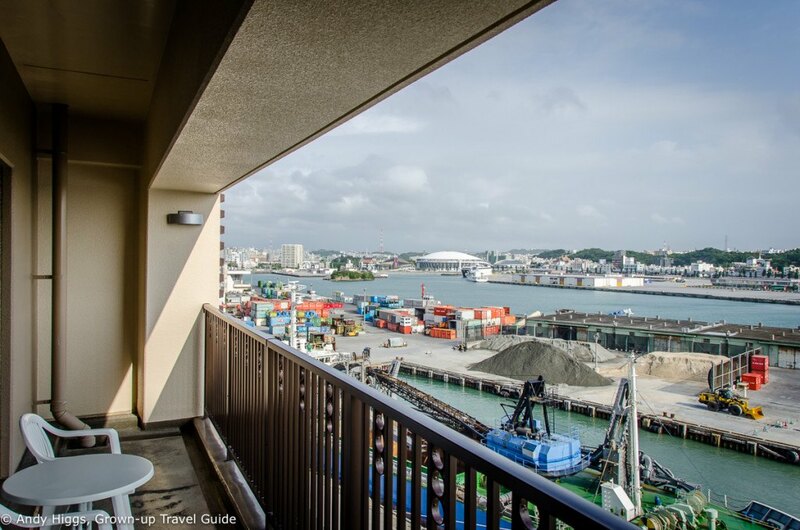 This is a large and modern hotel on the waterfront harbour area in Naminoue. 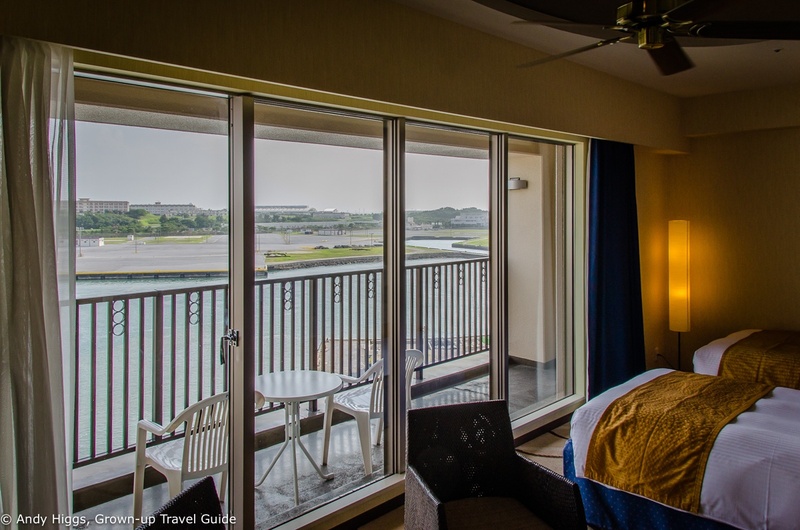 We were given rooms in the newest Spa Tower section with views over the docks. 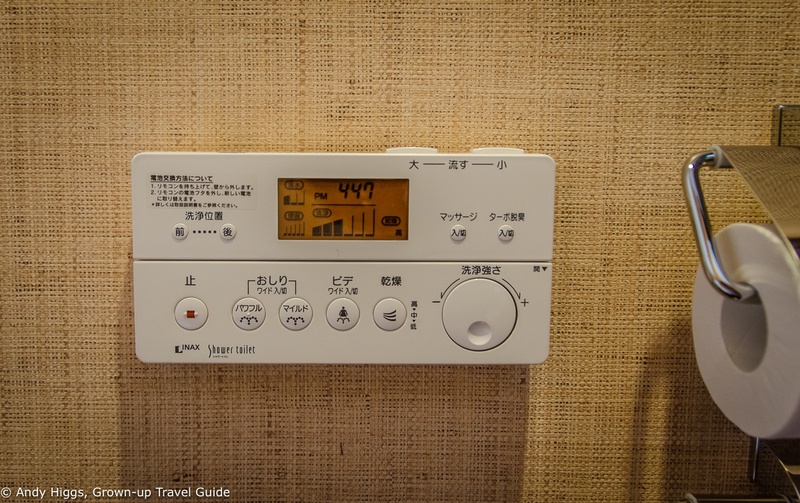 I liked the fact that the rooms had a ceiling fan as well as air conditioning, as I far prefer the former. It was nice to see the water and the balcony was a good size. Not quite a beachfront scene, but we are in the city after all. I’m sure most of these functions are not only harmless but probably rather fun, but better safe than sorry. Having settled in and had a brief rest it was soon time to meet up in the lobby and head for dinner. 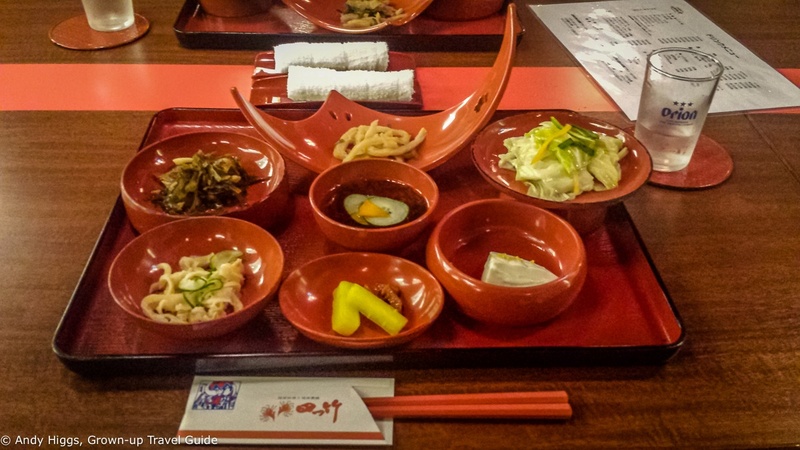 Another very popular place for a meal and a show, Yotsutake has two locations and we visited the one on Kokusai Street, a few blocks down from the more rustic establishment we dined at last night. 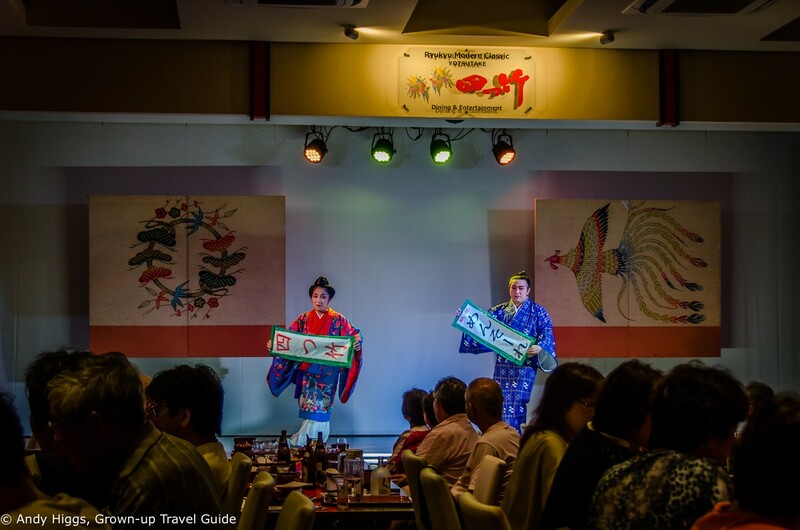 Here the entertainment was based on modern interpretations of traditional Ryukyu court dances and song. The food was very classy, too – a set meal of royal specialities. 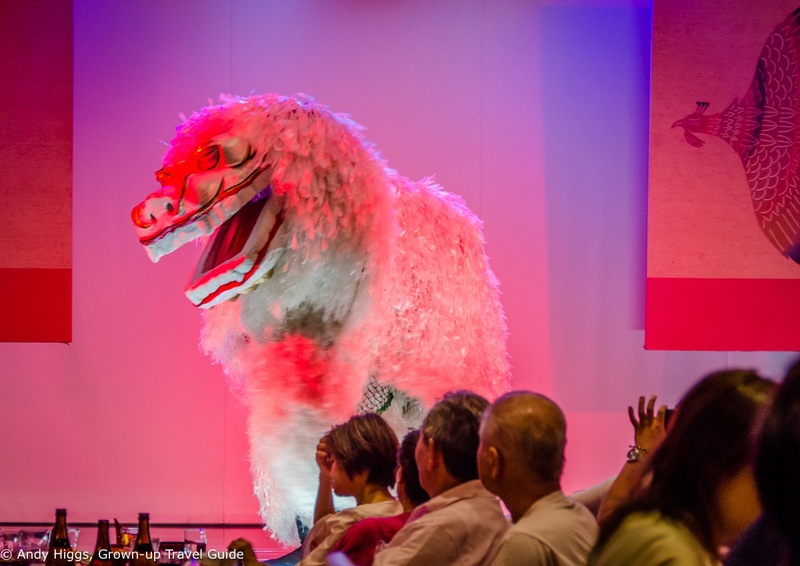 The lion dance is a popular part of this any many shows on Okinawa. 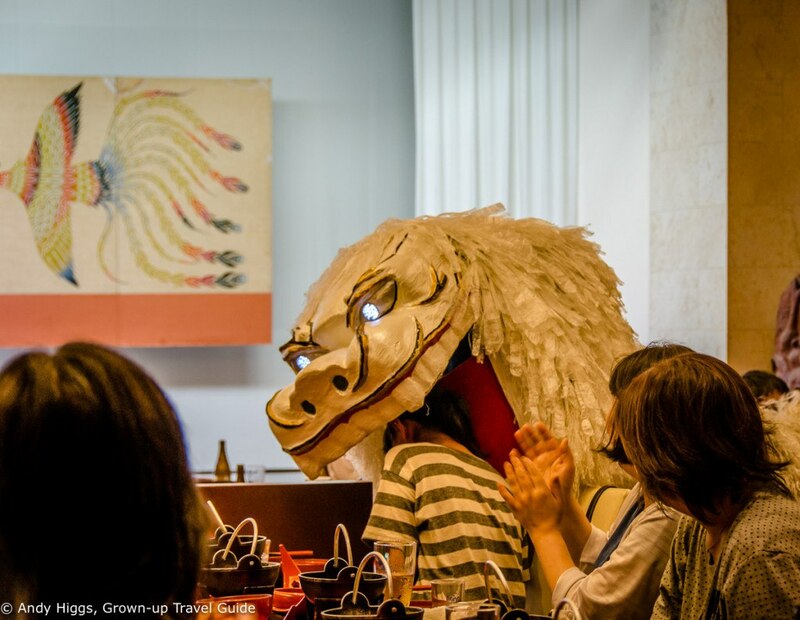 Both playful and slightly sinister (especially when the music changes and its eyes light up) the dance is different to the ones performed in mainland Japan and each community has its own version. Common to all, however, is the fact that being bitten – or rather eaten – by the lion brings good luck. 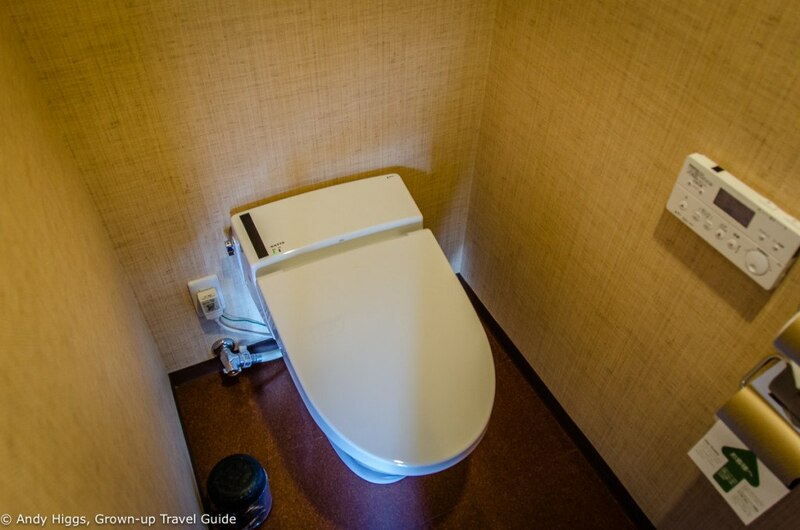 It was an entertaining end to an excellent day – tomorrow we were to leave Naha City and as we returned to the hotel I realised I would miss the place. It felt like we had only scratched the surface of what the capital had to offer but further exploration will have to wait until I return.